A little over a year ago, Provoc’s Health Study Recruitment Program launched publication of our Healthy Study Recruitment Insights–blog posts summarizing some of the knowledge we’ve accumulated over the years that we’ve been building, testing, and refining online platforms to recruit participants to health studies. January is full of retrospection, and we figured that between the (almost) anniversary of the Insights program and the start of a New Year, it’s the perfect time for a backward glance. In the same way you might peruse a gallery exhibition or volume of sonnets–we wanted to know, is the whole greater than the sum of the parts? Some key themes emerged right away. First, a comprehensive understanding of audience drives so much the work we do, beginning with the messages and content we deploy in our outreach. Another key theme is data–finding it, using it, collecting it, reporting it, and understanding it to implement and refine your health study recruitment program. Users, not surprisingly, feature heavily our Insights. We’ve written about the importance of understanding your audience, through focus groups, interviews, and surveys. Quantitative and qualitative data about users yield valuable information about the words, images, and ideas that drive people to action.We’ve also explored the way language can switch audiences from passive into active modes, so they’re primed to take the leap to sign up for a registry or study. We also noticed that research-forward content— words, images, and stories that highlight the science behind your study and the people conducting it–is amazingly effective. That’s not to say that recruitment content should be dense or convoluted–in fact, if you write with low literacy users in mind, your content can significantly enlarge your pool of eligible participants and make a dramatic difference in recruitment outcomes. Is your data strategy complete? Write what you know, they say–we took that to heart and wrote a lot about data! First, we collected data about challenges facing recruitment managers. If numbers tell the story about how hard it is to recruit people, they also can point the way to solutions–but you have to collect the right data from the right touchpoints in your recruitment system in order to be able to discern them. Data can also help you clearly define your target audiences and tailor your recruitment activities– for example, you can use demographic data to personalize outreach in remarkably powerful ways. Understanding audience, harnessing data to improve outcomes–once you solve these two puzzles, your study recruitment goals are well within reach. To be sure, you have your work cut out for you: whether digging in to the world of online advertising, refining your sign-up or registration forms, or deploying search engine optimization (SEO), the list of tasks involved online recruitment platforms is daunting, to say the least! How will you improve in 2019? The good news is, you don’t have to get it right the first time! Whether you’re recruiting 90 people for an independent investigator-run study or trying to enroll 300,000 participants in a registry–if you test, tweak, and test again–eventually you will reach your goal. 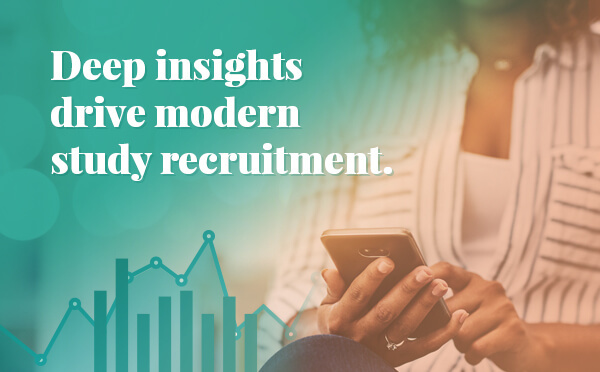 This retrospective look at Provoc Health Study Recruitment Insights reflects thousands of hours of inquiry, exploration, experimentation, and effort by our team, as we help recruitment managers fill their rolls and get on to the work of ground-breaking research. We’re enormously proud of this work, and ready to dig in even deeper to address the critical challenges in study recruitment that are holding back health research. Here’s to more hard work in 2019!